You guys might tell me I’ve been living under a rock, and honestly that might not be far from the truth. But did you know that on Friday nights there is like a marathon of Diners, Drive Ins, and Dives on the Food Network? I go to turn on the TV and my six year old gears up for one of her favorite cartoons and I have to crush her dreams. I can’t take even one more episode of kid TV. Despite this somehow, at some point during the evening, the whole family ends up curled up in front of the TV drooling over all the amazing (and sometimes weird!) food and trying to figure out if it would be at all possible to plan a trip to whatever location Guy Fieri is featuring. Yep. We know how to party. Now I’m going to share with you something that you should have while you are watching your marathon TV session…. 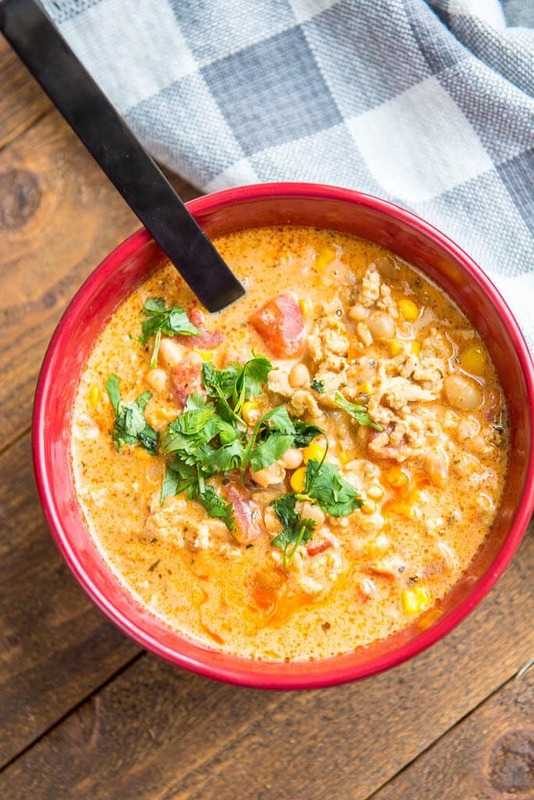 Slow Cooker Buffalo Chicken Chili. Yum! A great meal to come home to on a Friday night after a busy week. Easy to make! 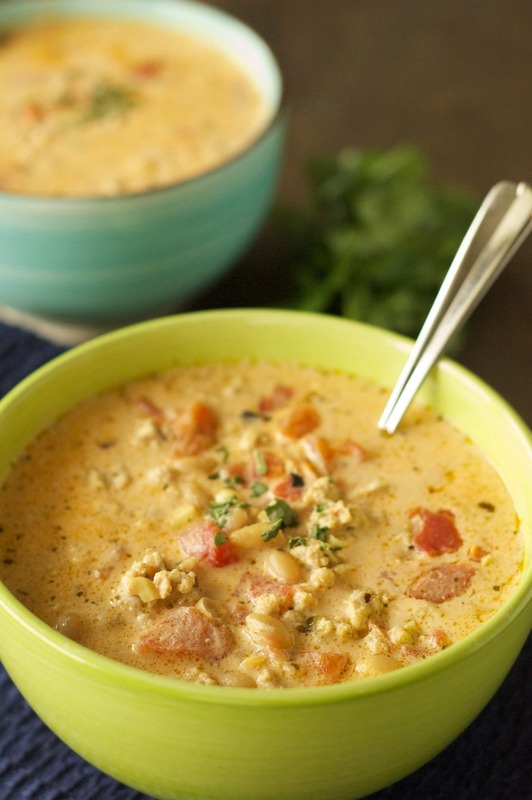 Easy to love this spicy, creamy goodness! 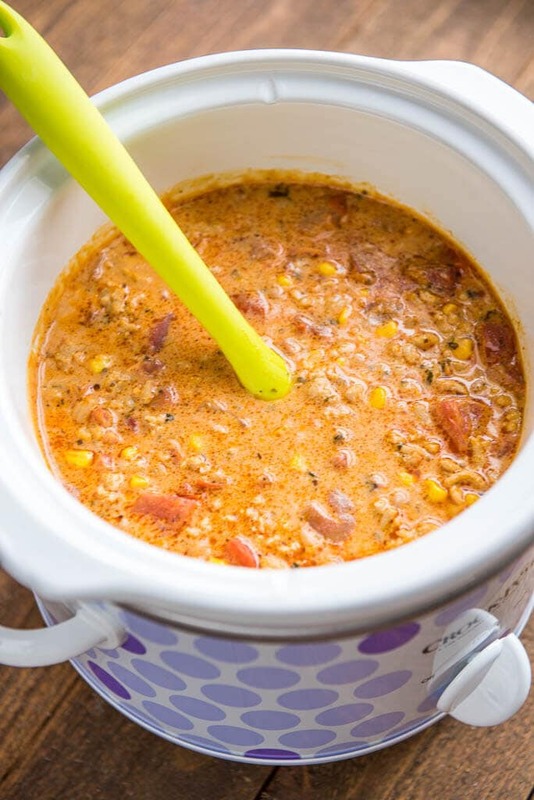 Heartier than a soup but different than a traditional chili this would be fun to serve up at a party, to take along to a tailgate, or to take to a potluck. 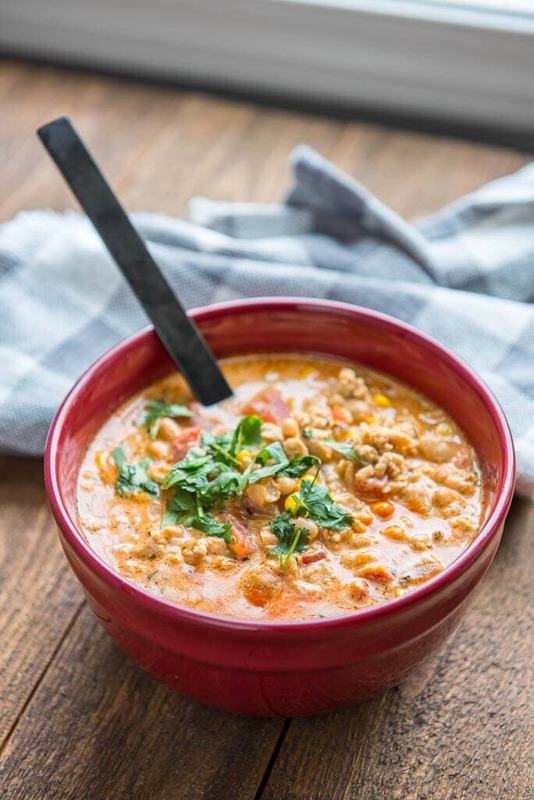 Ground chicken instead of beef and white beans instead of chili beans make the base of this chili. 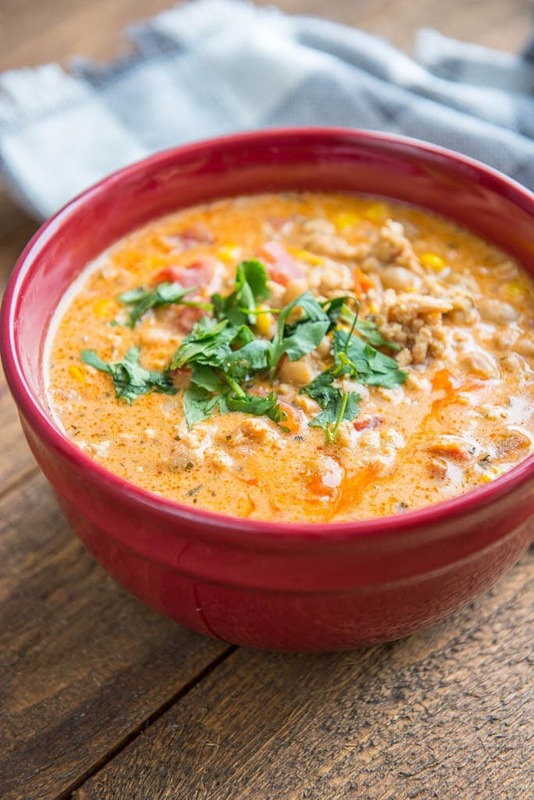 Lots of flavor from chicken broth, ranch dressing mix and fire-roasted tomatoes and some heat from the buffalo sauce are balanced out with some sweet corn and cream cheese. Top it all of with some cilantro for some super fresh flavor. And I can’t forget the blue cheese crumbles on the top! I leave them out of the soup since not everyone is a fan but I can guarantee you I have my bowl topped of with some! So park yourself on the couch with a big ‘ol bowl and watch endless episodes of Diners, Drive-Ins and Dives until you are convinced you should open your own funky restaurant so you can be featured on the show too. Or wait…is that just me? Yeah, I’m weird like that :). 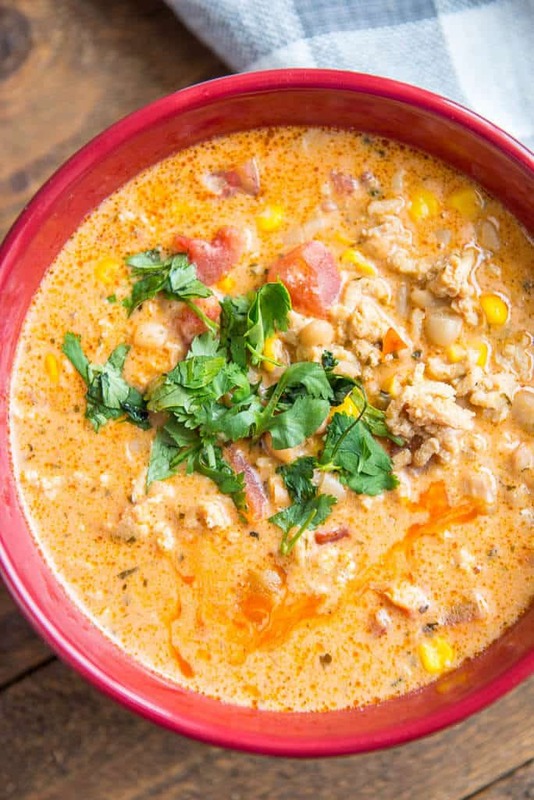 But at least it helps me dream up recipes like Slow Cooker Buffalo Chicken Chili! This recipe was originally published on April 7, 2014 and has been updated to reflect fresh photos and updates to the recipe based on reader feedback and re-testing. 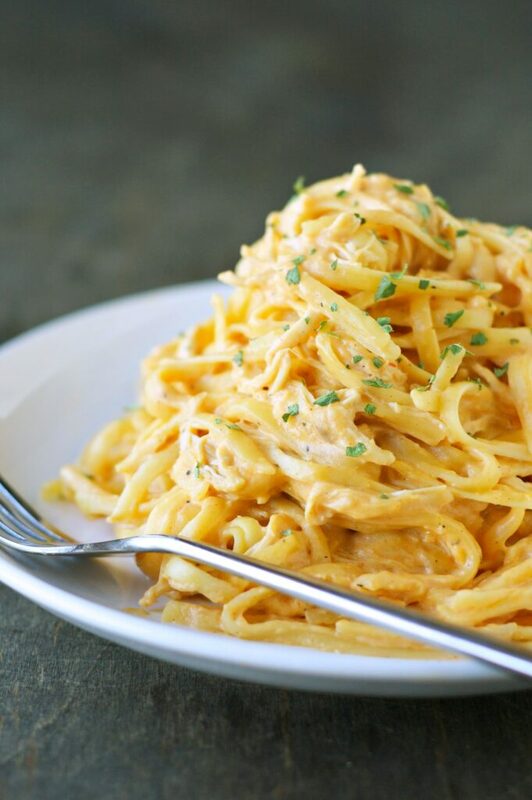 Can’t get enough buffalo chicken? I don’t have the exact amount, but it’s about a heaping cup I believe. My boyfriend and I are making this for the second time, today, and topping it with extra cheese. It’s delicious! I use this similar recipe but with chicken breasts shredded. Our daughter won her chili cook off too! 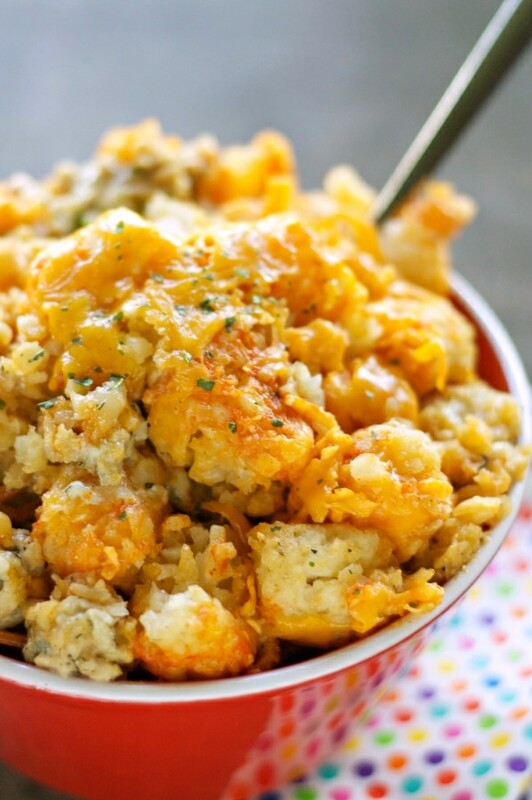 Can I double and freeze the leftovers?! We love this! It doesn’t freeze well due to the cream cheese, unfortunately. I made this for the first time last week as a test batch for my work’s chili cook-off this week. Knowing my coworkers are buffalo chicken fanatics, I knew that I had to try it. My fiance LOVED it and ate the leftovers for 3 nights in a row (that is unheard of with him – he is usually not a fan of leftovers). After the positive reaction at home, I made the recipe last night for the chili cook-off today and let it cook on low for 8 hours overnight. 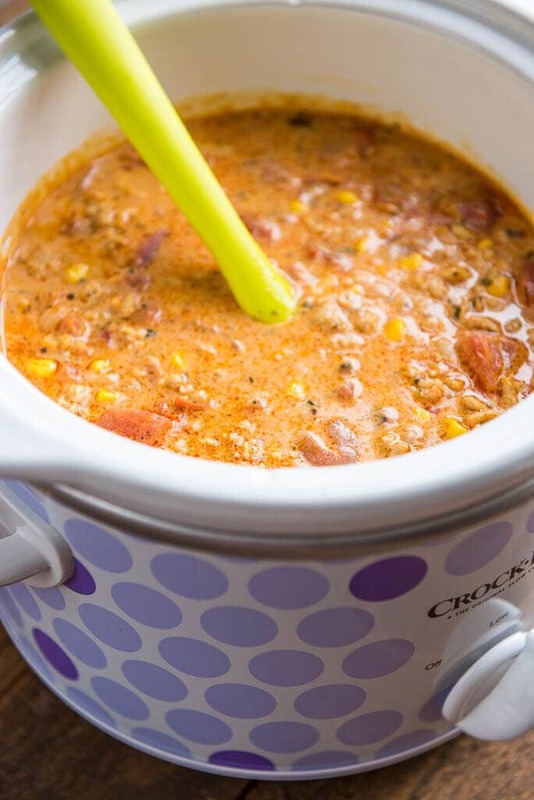 The recipe was doubled and filled the entire crock pot. Let’s just say that there was hardly any left at the end of the contest – and I won “Most Creative” for this delicious chili! I even had several people pull me aside after the event to ask for the recipe and give their compliments. Thanks for helping me to win! 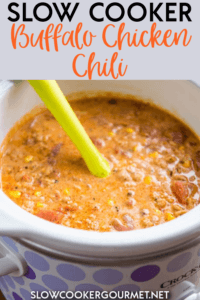 🙂 This will definitely be on my chili rotation list for cold Winter days! 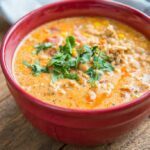 I tried this and won a chili cook off with it this weekend! So good! I did cut the amount of chicken broth in half and it was perfect. Thanks!